Few video games tackle the subject of religion, and when they do, it’s often through imitation, such as the fictional religion found in Skyrim, or the Church of Unitology in the Dead Space sequels. Commentaries on religion are frequently limited in scope and kept somewhat vague, specifically to avoid singling out any one group. In BioShock Infinite, however, the floating city of Columbia is enraptured by the beliefs of the Prophet Zachary Comstock, a devout Christian of the late-19th century American fundamentalist brand. Religion is far from the only subject addressed in Infinite, but it is arguably one of the most continually emphasized subjects. The game also discusses politics, bigotry and inequality, quantum mechanics, time travel, and alternate realities, among other topics. From practically the very beginning of the game, though, all the way through the very end, religion is front and center. It does not shy away from challenging questions, either, whether they are about the debate between religion and science, or about the intersection of faith and morality. In my opinion, this is a large part of what makes Infinite so unique and so interesting; while it has plenty of action, it is definitely a game that makes you think and feel – a breath of fresh air amidst popular game franchises like Grand Theft Auto, Call of Duty, and Halo. Warning: spoilers ahead. You may not want to continue if you have not yet completed the game. I am a huge fan of Ken Levine’s work, including the first BioShock, and especially including (my personal favorite) System Shock 2. It’s important to realize that Infinite is not the first time he’s made reference to the religious debate. At the entrance to Rapture, below the haunting face of Andrew Ryan, hangs the iconic banner that reads, “No Gods or Kings. Only Man.” The underwater utopia envisioned by Ryan is based heavily on the philosophy of Ayn Rand, who was an outspoken atheist. Rand advocated ethical egoism, elevated man to a heroic status, held a disdain for collectivism and altruism, and believed strongly in free will and laissez-faire economics. In interviews, Levine has stated that Rand was the major influence he drew upon in creating the environment of Rapture and the figure of Andrew Ryan, and he found this to be particularly intriguing and challenging because, in some ways, he is sympathetic to certain views held by Rand and Ryan. Levine has also explained that one of his interests for BioShock Infinite was to create an antagonist notably different from Ryan, perhaps even someone at the other extreme. The contrast of the city in the clouds with the city underwater is just one of many inversions we can find between BioShock 1 and BioShock Infinite. Columbia’s philosophy is nearly the reverse of the banner above Rapture: men are little more than instruments for a greater good, that envisioned by the “king” – Prophet Comstock, actually – who claims to receive his authority from no less than God himself. While Ryan places individualism as one of the highest priorities, going so far as to claim that a man chooses, while a slave obeys, Comstock fosters an atmosphere of racism and social inequality, and premises many of his beliefs on an alleged gift of foresight to a predestined future. 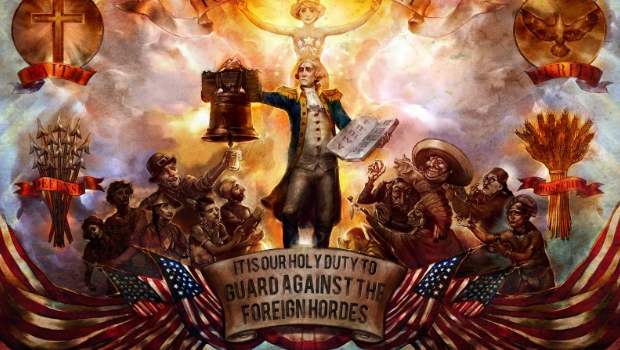 There are many other similarities with Mormonism in BioShock Infinite, like the temple at the beginning of the game, with all its members dressed in white robes, and the abundance of large religious statues throughout Columbia. Oh, and did I mention the City of Enoch, which Mormons believe was taken up into heaven by God, and will return for the Second Coming of Christ? Of course, there is more to Comstock’s religion than a simple imitation of Mormonism. There is the strong sense of American exceptionalism, held with such fervor that the Founding Fathers have been deified within the religion of Columbia. In the game, there is a particular painting of George Washington holding up the liberty bell, with the Ten Commandments in his other hand. Four corners of the painting are marked by symbols of a cross, a dove, arrows, and wheat, with the words “Faith”, “Purity”, “Defense”, and “Prosperity”. What’s interesting about this piece of artwork is how it conveys a similar message to a real painting done by Jon McNaughton, shown below. This work is titled, “One Nation Under God”, after words that were added to the United States Pledge of Allegiance as late as 1955. It depicts Jesus Christ holding the US Constitution, with the American Founders standing close by in the background, hands over their hearts, as if Jesus were delivering the Constitution from heaven to them, on the condition that they pledge themselves one nation under god. McNaughton’s paintings are not tongue-in-cheek, as is made clear by various statements on his website, and his comments in interviews. “One Nation Under God” has become his most popular work, not because of its sheer ludicrousness, but because there are those who support its message. Before Infinite was released, there was much speculation that it would feature somewhat of a parody of the Tea Party movement. The voices that, for better or worse, spoke up loudest in defense of Tea Party principles, were religious conservatives like Glenn Beck, Sarah Palin, Michele Bachmann, and Rand Paul. It’s easy to see some connection between the themes of Infinite and the themes emphasized by these figures, but I don’t see Infinite as being all that focused on the Tea Party. Fortunately, it targets deeper issues and deeper questions, albeit ones that are very much about the intersection of faith and politics. There are people out there like David Barton [who claims BioShock Infinite is teaching kids to hate conservatives and Christians], who seek to establish a revisionist history for America, tying it in to their fundamentalist religious beliefs just like Jon McNaughton and Zachary Comstock. Levine’s depiction of the unique religious beliefs of Columbia in BioShock Infinite is no more of a caricature than was his depiction of Ayn Rand’s philosophy in the first BioShock game. On the other hand, not everything the game says about religion is so obvious. At the end of the game, you come to find out that Booker, unable to forgive himself for his participation in the massacre at Wounded Knee, sought to make things right by being baptized. However, he didn’t go through with it and opted out at the last minute. Except, in another reality, going through with it changes him into Comstock. The baptism, it seems, only turns him into more of a monster than before. The god he finds is a vengeful one that crushes its followers into repentance. Perhaps this is the penance Comstock forces on himself for Wounded Knee. Or perhaps his conversion merely reinforces the prejudices he already had within him, now believing he is justified by God Almighty. Whatever the case, Booker’s redemption only comes through Elizabeth, not from baptism or from acceptance of any religious belief or identity. To cast things in another light, though, the means by which Booker finds redemption through Elizabeth is in sacrifice. The sole hope for breaking the circle of failed attempts at saving Elizabeth, and thereby saving yourself, is to essentially lose yourself, to sacrifice your life in return for hers. There is also a strong theme of the “sins of the father” in Levine’s two BioShock games. By the end of BioShock 1, you discover you are the illegitimate son of Andrew Ryan, and you have been conditioned to kill upon hearing a certain phrase, one which results in you, the son, murdering your father. By the end of Infinite, you discover you are the father of Elizabeth, who has the ability to bend space and time (which is restricted by the Songbird, who is controlled by a certain melody), and Elizabeth’s ability eventually results in your own death at her hands and the hands of her alternate forms. The corruption of humanity is definitely familiar to Christianity, as Jordan Ekeroth notes in the third link above, as is the notion that only a loving sacrifice will end the cycle of destruction and bring about salvation. If I speak in the tongues of men or of angels, but do not have love, I am only a resounding gong or a clanging cymbal. If I have the gift of prophecy and can fathom all mysteries and all knowledge; and if I have a faith that can move mountains, but do not have love, I am nothing. If I give all I possess to the poor and give over my body to hardship that I may boast, but do not have love, I gain nothing… For now we see only a reflection as in a mirror; then we shall see face to face. Now I know in part; then I shall know fully, even as I am fully known. And now these three remain: faith, hope, and love. But the greatest of these is love. A common complaint against Infinite is that we don’t really get to see any of Booker’s transition to becoming Comstock. But in my opinion this has been left up to the imagination of the gamer for good reason. Is Comstock aware he’s a fraud or does he actually hold to all the beliefs he espouses? It doesn’t matter either way. He talks with a silver tongue, he speaks in prophecy, and he has a faith that boasts of great conviction, but he is missing that crucial thing that could make it all count for something true. Comstock is so devoid of love that he murders his wife, he murders the two people that made his dream of Columbia possible, and he confines and tortures his own daughter, all for the goal that his legacy of fire and brimstone will live on through Elizabeth. And waiting to usurp his place is none other than Daisy Fitzroy, who claims to speak for the poor and oppressed, who gives her body to fight for the people, but is so lacking in love that she nearly kills a child in her quest for liberation. So is Infinite a “deeply Christian game”, as Ekeroth believes? The game begins with the voice of Elizabeth asking Booker, “Are you afraid of God?” “No,” he responds, “but I’m afraid of you.” Why would he fear Elizabeth, but not god? To be blunt, it’s because god is not there. The city of Columbia, despite all its religious language and devotion, is godless. Comstock’s prophetic visions and the miraculous floating of the city are really due to the scientific technology of the Luteces. The future shown to Comstock is just one of many possibilities, which is overcome by Elizabeth’s manipulation of space-time. God is conspicuously absent when Booker hands over his daughter, when Comstock rises to power, when Elizabeth is captured and tortured, when she destroys New York City in 1983, and when Booker is finally drowned. If you’ve noticed, the person present for all those events, often turning the tide in her favor through her own effort, is Elizabeth. Booker fears her because of what she represents – not just in her power, but in his past, and perhaps even in his future. Though it has religious overtones, Infinite is not a game about religion, it’s a game about people. Ken Levine has stressed this multiple times, that the focus of the story is on the relationship between Elizabeth and Booker. In that regard, it is a somewhat significant departure from the first BioShock. There is plenty of complex subject matter in the setting where that relationship takes place, but a good deal of it (maybe even all of it) points back again to Elizabeth and Booker. Like the best comedians use humor and laughter to drive home hard, sometimes controversial life lessons, the best writers use the aspects of the human experience with which we are all familiar to drive home hard, controversial lessons of their own. Some players may not like the fact that there is no positive Christian alternative to Comstock, but for me this only reaffirms that the game’s focus is not actually on religion. What’s more intriguing to me is that the first game, as popular as it was, did not seem to garner an extreme visceral reaction from Ayn Rand followers. Nothing in BioShock 1 really offers a counter-point or positive note to end on regarding the philosophy of people like Ms. Rand. Infinite does have a light at the end of the tunnel, though, and yet there continue to be outraged responses from conservatives and Christians alike. In an ironic sort of way, Levine’s game has possibly revealed some things about the kinds of people who subscribe to such religious and political beliefs, without even really saying much itself, but in simply allowing individuals like Barton and Malmberg to make fools of themselves. Of course, we didn’t need BioShock Infinite to show us that. In conclusion, then, while religion features prominently in the world of Infinite, there is really no message to be gained from it other than a warning against placing ideology on a pedestal above the things that truly make us human and truly make life worth living. This was the message delivered in BioShock 1, where Andrew Ryan had sacrificed basic regard for human life to his preferred ideology – an ideology that paradoxically claimed to value man above all else. I see Levine as doing something similar and still different in Infinite, showing Comstock sacrificing the human need for love to his ideology – an ideology that claims love as the greatest thing of all, even greater than faith. In a fascinating twist, it is Booker, the unbaptized, seemingly irreligious predecessor of Comstock who is finally able to sacrifice the only thing he should have the right to sacrifice, giving his life out of love for his child. Many born again Christians look back on their previous lives of “sin”, before they accepted Christ, with groaning and despair. How lost they were. Comstock certainly treats Booker this way throughout the game. But what if things are not so simple? What if the choices we make now shape the way we view our past? It isn’t just our past that affects who we are today, nor is it just that our decisions affect who we become in the future. At times it may indeed seem like there are infinite worlds of possibility, infinite ways of carrying on with this journey of life. That a video game can capture some of this experience may seem like a miraculous feat in itself. 1. Eddie Makuch, Valve refunded BioShock Infinite gamer upset over religious scene, Gamespot (April 17, 2013). 2. Omri Petitte, BioShock Infinite artist almost resigned over game’s depiction of religion, PC Gamer (March 1, 2013). 3. Jordan Ekeroth, In Defense Of Religion In BioShock Infinite, Kotaku (April 17, 2013). Previous PostPrevious The Atheist Prayer Experiment?